Even before displacing Nokia as the world's top smartphone maker in the most recent quarter, Apple has long consumed a disproportionate slice of the industry's profits. 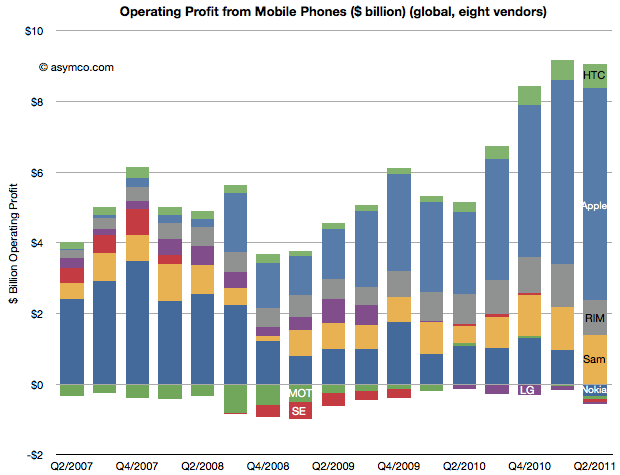 Apple first grabbed the largest slice of phone profits in mid 2008, just a year after the iPhone went on sale. That slice climbed to 50 percent of the industry's profits by last year. This quarter however, an overall decline in profits among top mobile makers kicked Apple's share of total profits up past 66 percent, with Samsung pulling in the next largest slice of profits with just 15 percent, RIM collecting an 11 percent share, and HTC bringing in 7.4 percent. Nokia, Motorola, Sony Ericsson and LG all managed to lose money selling phones in the quarter, as presented graphically in a chart by Horace Dediu of Asymco (below; other charts on the Asymco site). The role reversal of Apple and Nokia since the appearance of the iPhone in 2007 is particularly striking. 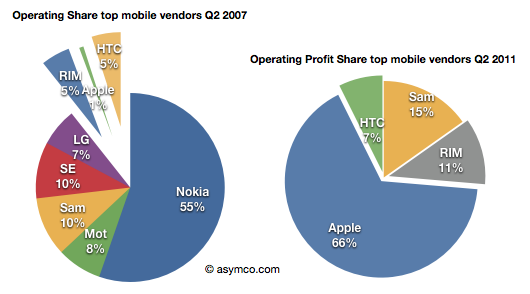 Just after the iPhone debuted, Nokia had a 55 percent share of mobile profits while Apple claimed just a 5 percent sliver. This year, Apple's slice of the pie is even larger than Nokia's was four years ago, and Nokia can't claim any percentage of the industry's profits.